I've just been too busy to sit down and write any posts lately. I'm finally getting around to it, so here is a re-cap of the last week or so. I've been pretty good on the eating lately. I had my one month check in after starting DDP Yoga over the weekend. I'm pretty excited to report a 2" loss in most areas, my hips however are holding on to that pear shape. Only one inch lost there for now. So far, so good. Trying to keep it rolling. One of my favorite things to cook in the crock pot is a whole chicken. I just drop it in with a bit of water in the bottom of the pot, season with salt, pepper and paprika and let it cook for 6 hours on low. Take the chicken out, pour what's in the bottom of the pot into a sauce pan, add a couple tablespoons of better batter and stir away until you have a nice gravy. Roast some asparagus in the oven with olive oil, salt and pepper. Boil some butternut squash, mash with Earth Balance, maple syrup, cinnamon, salt and pepper. 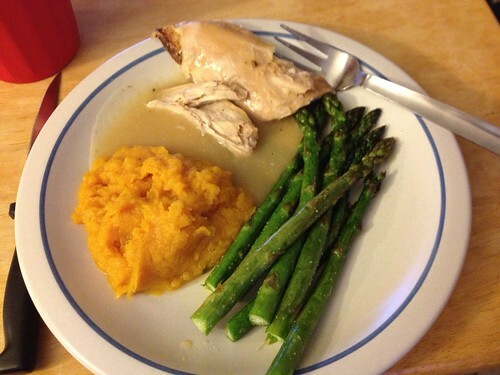 Such a delicious and EASY dinner! I made this last Wednesday. The leftovers are also nice, make another meal out of it, or chicken salad, yum! I've been all over the place in the past week, my little brother (not really little anymore...) got married on Friday! It was a lot of fun. We had the rehearsal dinner Thursday night, then I spent Friday at a hotel getting ready with the bride and the rest of the bridal party. My new sister-in-law gave us these beautiful bracelets. 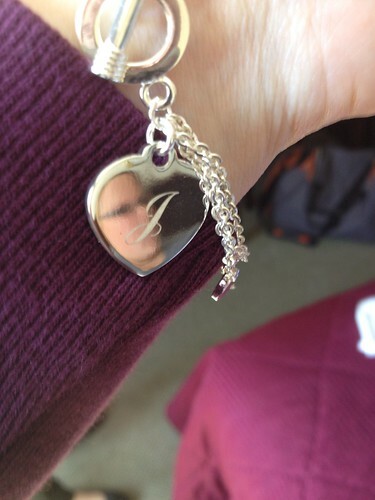 That's her reflection in the heart. I love mine. 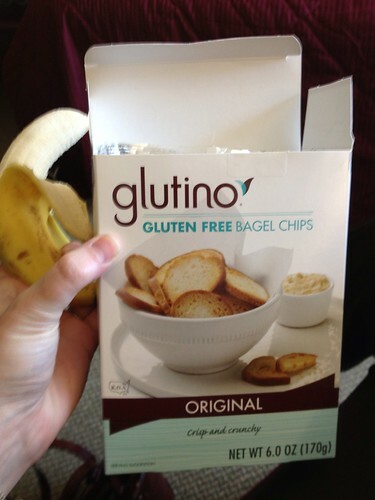 I had stocked up on snacks to have throughout the day including these Glutino bagel chips which I had never tried before. I LOVED them. So good. They don't taste gluten free at all. Saturday night we had friends over to our place. We love to entertain and we went a little overboard with food this time. One thing about entertaining is that our friends always bring their own alcohol and anything that they don't drink, they leave with us. Neither of us drinks beer, and all of our friends DO, so it doesn't take long for our fridge to fill up with leftover beers. 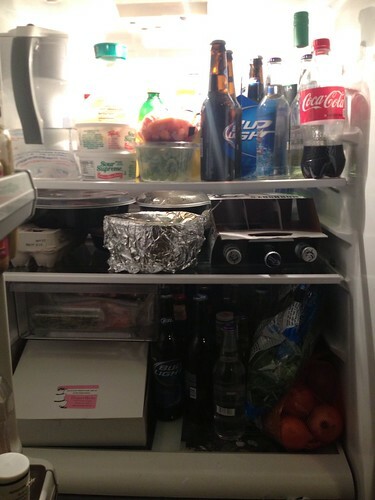 We need to have a "clean out our fridge" party. I didn't get any pictures of the food we served, but it was all good stuff. I made spinach dip from scratch, it was not great, I'd try again but add more seasoning. I served it with some of those bagel chips and tortilla chips. We also had buffalo chicken dip and toasted ciabatta bread topped with tomato and mozarella (none of this was gf, nor did I eat any of it). For dessert we served a random sampling of treats from Dessert Works bakery which does offer GF options. We didn't get anything GF that day because I had bought some gf brownies that I had seen at the grocery store and hadn't tried yet. They were gross. Dry and crumbly and tasteless. How disappointing! The rest of the weekend we relaxed and enjoyed the beautiful weather. This week I've been in training for work so I've been away from my desk. I'm still on my quest to clean up my diet so this week I'm trying to add in fresh vegetable/fruit juice. B bought a juicer a while ago after we watched Fat, Sick and Nearly Dead. He used it for one week and it has been collecting dust ever since. We made smoothies in the blender for a while but I couldn't quite get into those. I didn't find a combo I liked that much. I was thinking that juicing might be an easier start, plus I've seen a lot of recipes that sounded good to me lately. This morning I tried my first one - Celery, Spinach, Kale, Granny Smith Apples, Carrots and Grapes. I only got a half of the water bottle filled with juice after all of those vegetables went into the juicer, but that's ok. It was pretty delicious and I felt so good drinking it. 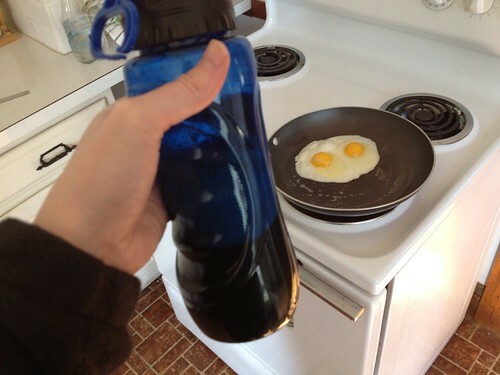 I added a side of eggs over easy to get my protein in, otherwise I would've been starving by lunch time. I made it until mid-day before I started to feel really hungry and then I waited too long to eat so by the time I got around to it, I was starving. 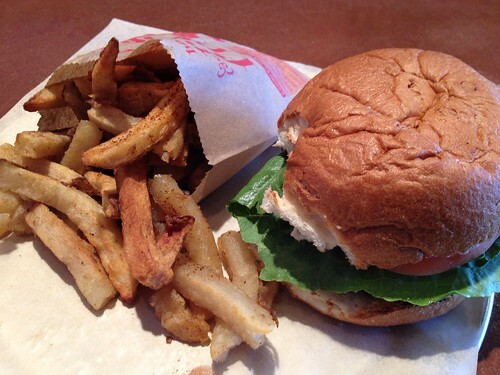 I had to run to the bank so I decided to stop by b.good for a burger on a GF bun and I also went for the fries. It hit the spot. I resisted having a treat after. I've gotten into the habit of having some kind of chocolate or something sweet after lunch and I really need to break that.